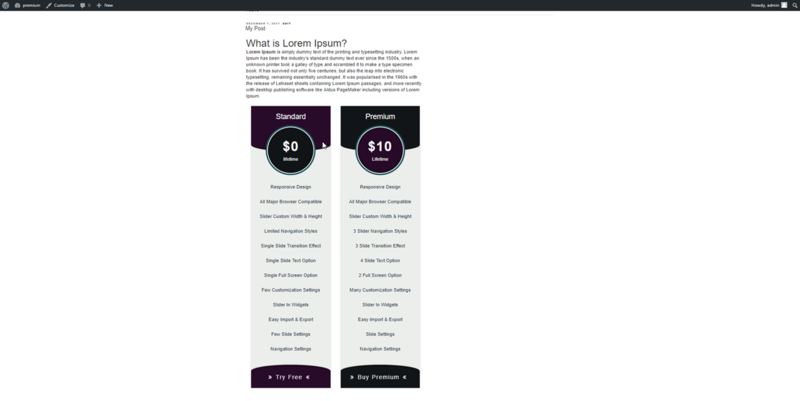 First, you download Pricing Table Premium plugin. upload Pricing Table Premium zip file of the plugin by clicking the Browse button. 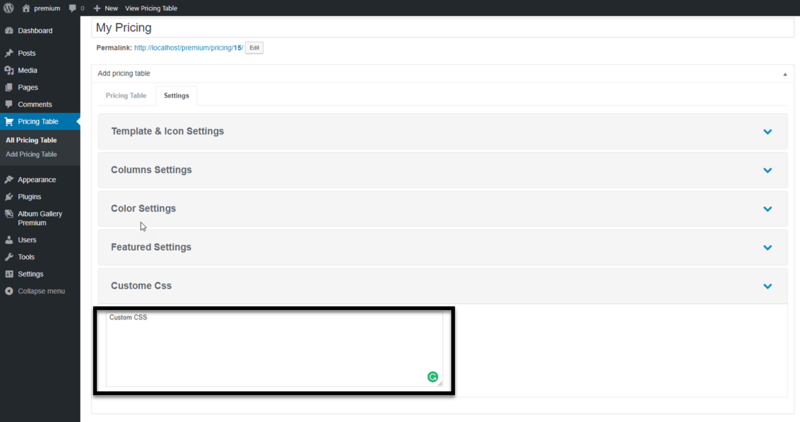 after upload Pricing Table Premium plugin, click on Install now button. 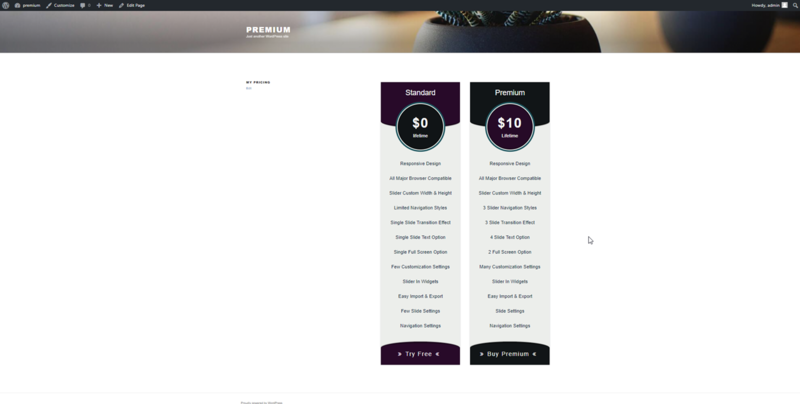 And activate the Pricing Table Premium plugin. For create gallery click on Pricing Table Premium in the admin menu bar. Then click on Add Pricing Table. A. Type your Pricing Table title in the text box. B. Now you need to add columns in Pricing Table click on Add image box. 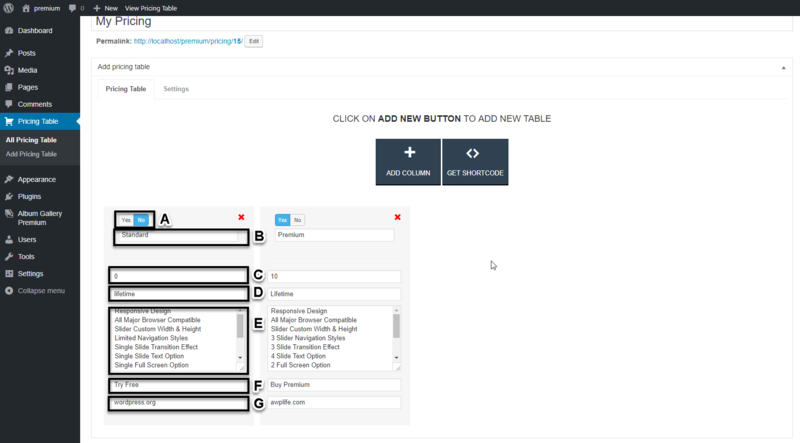 Now you have successfully added columns, Now you have to add details in tables. A. select yes if you want to mark this column featured. B. Type Price without currency symbol. C. Type column name / plan name. D. Type Plan duration like – one month, three months, one year and lifetime. E. Now type your plan details, just type your points after a point just take an enter the enter means a new line. F. Type text tor button. G. if you want to redirect user then fill a link if you don’t want, leave it blank. Click on “Get Shortcode” button for the shortcode. now copy the shortcode from the popup. 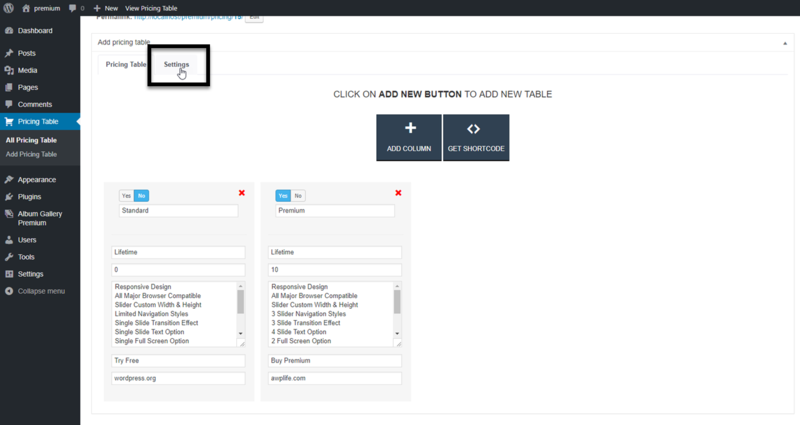 Paste the shortcode where you want to show Pricing table on any Page or post. You can set the pricing table configuration. for the configure settings please click on the settings tab. A. We have more than 20 templates for pricing table, you can select anyone. B. You can select currency as you want to show. C. when you will select any one template you can see a template image for a look. you can select the columns like – if you have two table but you want to show only one then select one column. 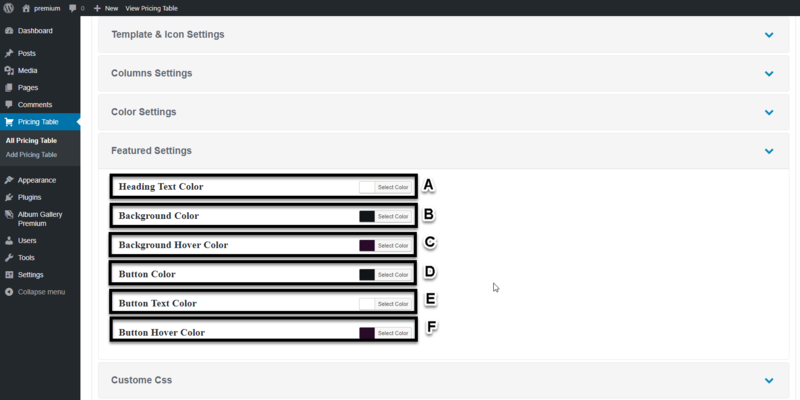 you can set colors of pricing table template, you can use any color because we have given you color pickers. A. Heading text color. B. Background color. C. Background color on hover. D. Button color. E. Button text color. F. Button text color on hover. this color setting for a featured table. when you select a table featured these colors will show. Copy Pricing Table Shortcode from the pricing table settings page. Click on any post where you want add Pricing table. A. Pick the text widget. B. And drop in the sidebar. B. Paste the shortcode into the content box. C. Click on the save button (that’s all).